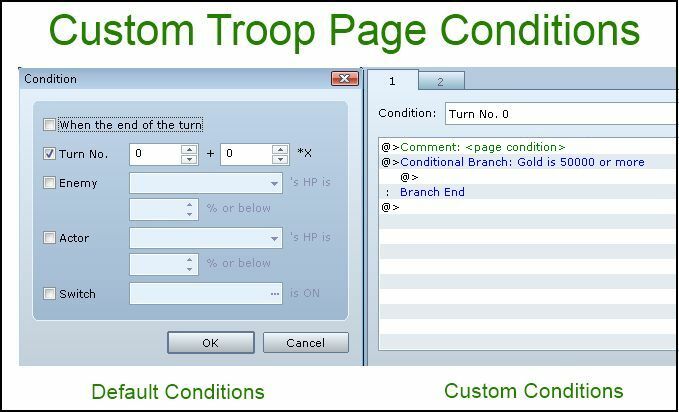 This article discusses (what I consider to be) a major limitation in the RPG Maker event system: page conditions. I will then discuss a script that allows you to work around this limitation, allowing you to build even more complex events. The contents are based on RPG Maker VX Ace but the same concepts can be applied to VX and XP. What we are interested in are the event pages. For an event, at most one page is ever active at any time. In this example, page 1 has a graphic of a kitty, and page 2 has an empty graphic. When page 1 is active, you will see a kitty. When page 2 is active, you will not see a kitty. A page is active if all of the page conditions have been met. So in our kitty page, there is one condition: Switch 24 must be ON. 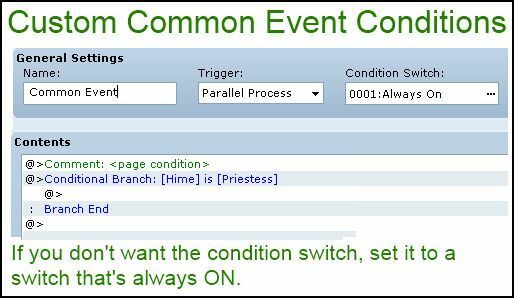 If the switch is ON, then the condition is met, and the page will be activated. If it is not met, then the engine looks at another page and checks whether it can be activated. This is probably the most important thing you have to remember. In our kitty event, the engine starts by checking page 2 first, and then it checks page 1. In general, it starts by checking the last page, and then works its way backwards. This means that if the last page has no conditions, then it will be activated, even if the first page has no conditions. Do not forget the order of page checking. The conditions should be self-explanatory, provided you know what they mean. But if you are confused you may leave a comment. There are only 4 self-switches to choose from. And of course, you’re given the option to check whether an item exists in the inventory, or whether an actor is in your party. Armors or Weapons in inventory? Whether a state is applied (or not applied)? Whether two specific actors are in the party? Whether you have 5 potions and 10 hi-potions? What about a conditional branch? For all of the other conditions I’ve proposed, you might argue that we can just use a conditional branch for this. Indeed, the conditional branch event command does support all of them, and more. And it supports formulas, so you can basically condition on absolutely anything you can think of. But this doesn’t work. It just isn’t the same. 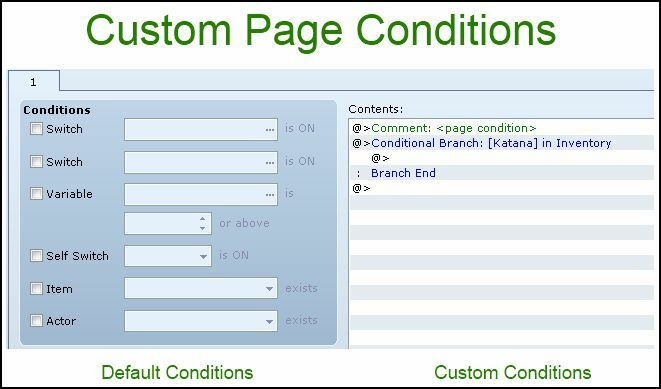 A page condition is used to determine whether a page is active or not. A conditional branch is used to control the flow of the event logic when it is running. Simple example: you have a kitty event. When “White Armor” is in your inventory,the event graphic will show a white kitty. When “Black Armor” is in your inventory, the event graphic will show a black kitty. When both armors are in your inventory, the event graphic will show a white kitty with black spots. How do you accomplish this with a conditional branch? Can it be done? The answer to the question I proposed above is, in fact, yes. 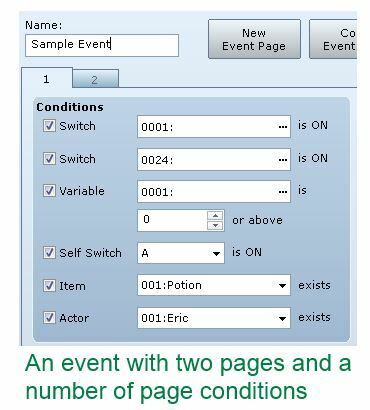 It is possible to use the conditional branch as an event. The trick is to convert your conditional branch into a page condition. This is not supported by the editor, but we can accomplish this using scripts. Just like that, you’ve added a page condition that checks whether a particular weapon is in your inventory. Need another condition? Repeat the process until you have all the conditions you need. Now we can tap into the conditional branch’s power and use all of the conditions that it supports, and if there’s something you need that it doesn’t support, use a formula in the script call. In the beginning, we looked at the event editor and the options that they provide you for page conditions, and we realized that it is quite limiting. I then showed you a script that allows you to surpass this limitation, using tools that you are already familiar with. 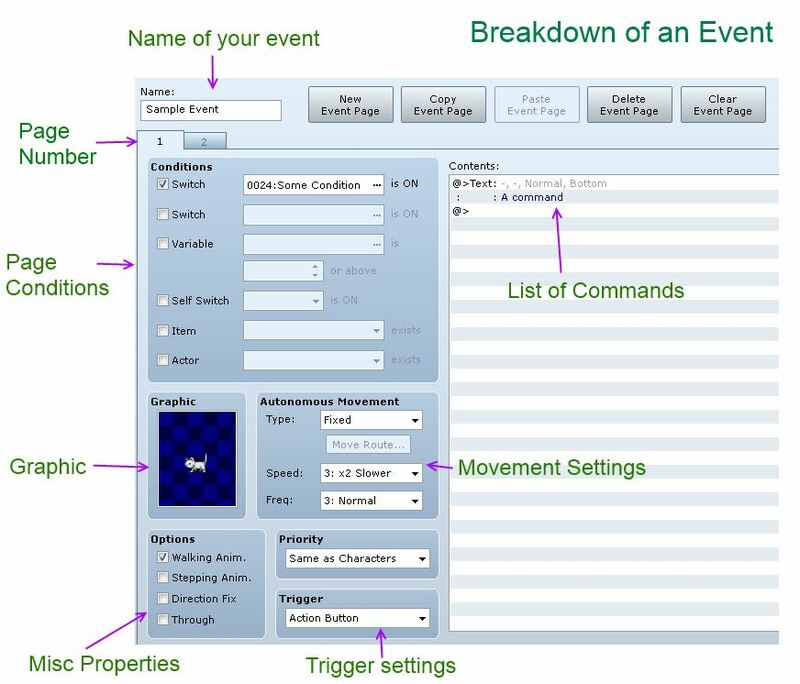 Finally, I extended it to all of the other kinds of events that you might be working with, creating a very versatile tool set and enabling you to implement all kinds of complex logic without having to resort to additional scripts just to prevent a page from activating for trivial reasons. I like the script. I’ll definitely be using it. I noticed the event limitations, too. I’ve been trying to figure out a edit the game editor.